In many parts of the world unexploded ordnance and landmines still pose a significant danger to the local population. 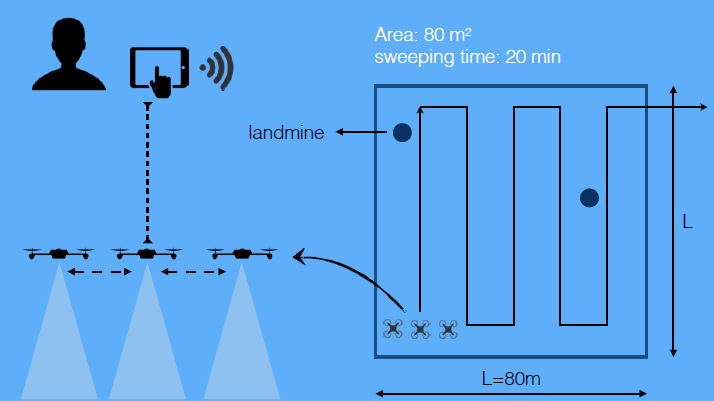 A huge variety of systems and sensors have been developed to tackle the project of landmine detection yet the clearing rate is still fairly low and the risks remain very real. This project is about building an integrated UAV based Ground Penetrating Radar system. While we are looking at landmines and UXO initially, there are other use cases in utilities, law enforcement and other domains. Given a stream of GPR data in the context of demining (see above) there is still the significant challenge of identifying landmines amongst the subsurface clutter. This project is tackling the challenge through the use of real and simulated data and exploiting recent advances in (deep) machine learning. The two main sensor modalities used to detect landmines are GPR and EMI (i.e., metal detector). This project explores the feasibility of having a UAV mounted active or passive EMI sensor. While dubious initially it turns out a useful demonstrator system can be built though operational challenges remain to be tackled. We also plan to extend this to passive sensors (magnetometers). Pretty much every UAV application requires good positioning or localization in order for the sensor data to be processed sensibly. There are many ways of estimating position. This project is specifically about the integration of a commercial grade RTK GPS receiver with a large multi-rotor and fixed wing system and extending it with other modalities. In particular this has involved a number of experiments with SVO and LSD SLAM. A project in collaboration with Bristol Robotics Lab whose aim is to demonstrate a true swarming capability (i.e., not multi-robot) for applications that involve maximizing area coverage. The core system is built around ROS with hardware from Erlebotics. This is a project with International Animal Rescue and Bristol Robotics Lab. As part of an animal welfare and ecological research project, orangutans in Borneo are implanted with VHF beacons so they can be followed through the jungle. Unfortunately the tracking signal has a limited range and manually navigating the jungle to pick up signals is extremely cumbersome. Better coverage can be obtained by flying above the canopy with a UAV mounted receiver and homing system. A small side project to leverage recent work in deep learning to build a real time, flying object detector. This is a project supported by the Nuffield Foundation. Finally a personal project I have been brooding on for a long time is to build an autonomous litter robot. Spurred on by the recent summer school on autonomy in aerial robotics I have started working on this. Hence there is still a long but fun road ahead with wonderfully (hopelessly?) challenging detours into control, SLAM, computer vision, and kinematics. This entry was posted in humanitarian, Machine Learning, research, Unmanned Systems and tagged demining, gpr, machine learning, projects, robotics by dgorissen. Bookmark the permalink.